"Eggplant goes great with tomato, hamburger and garlic in this easy-to-prepare and well-seasoned recipe." In a large skillet over medium heat, saute the ground beef, onion and garlic for 5 to 10 minutes. Drain excess fat. Stir in the tomato paste, water, tomatoes, parsley, thyme, oregano and basil. Set aside. Slice eggplant into 1/4-inch rounds. Place a layer of eggplant into the bottom of a lightly greased 9x12-inch glass baking dish. Then place a layer of the ground beef mixture over the eggplant, followed by a layer of sliced onion. Top this with 1/2 the breadcrumbs and cheese. 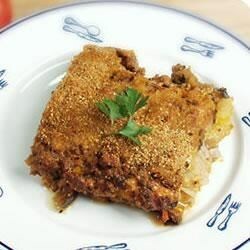 Then repeat the layers: eggplant, ground beef mixture, sliced onion and remaining breadcrumbs and cheese. Cover and bake at 350 degrees F (175 degrees C) for 1 hour, remove foil and bake for 20 more minutes. While I love eggplant and am always looking for new recipes for it, my husband is a bit of a skeptic. I think I might have started changing his mind with this one! We both enjoyed it. Quite tasty - I would reduce the meat by a third and add lots more vegetables like mushrooms and carrots. Looks lovely on the table, but takes a lot of time to prepare.